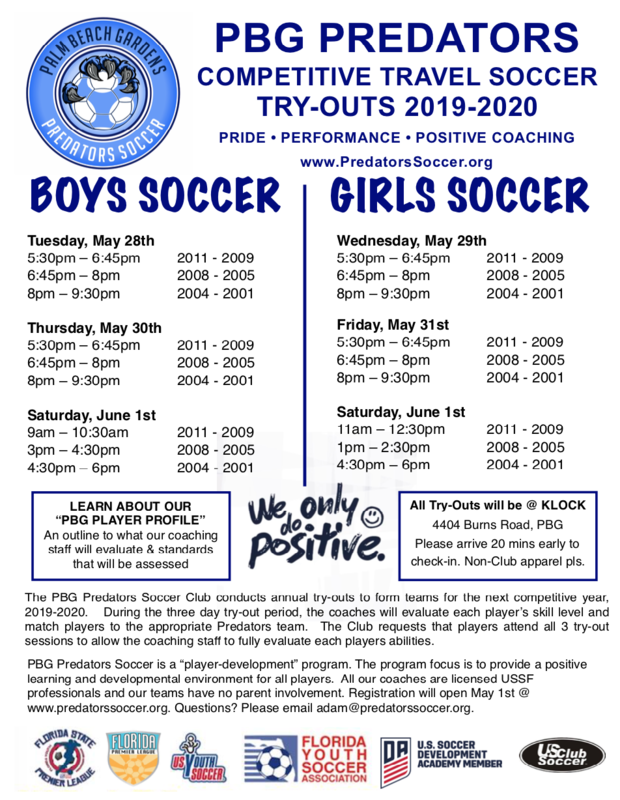 The following information is to help players and parents understand the process regarding try-outs, assessment and selection for the Predators competitive soccer organization. Talent with and without the ball. A player must possess individual skills and the potential and desire to improve. Talent is one factor that contributes to the success of an individual player and players must show hard work, energy and effort to gain placement in the Club. All players must possess intelligence for the game and an interest to listen and learn. The player and family is committing to the long-term success of the player for the whole year. This commitment represents both player and parent with full-time attendance to all training sessions, games and travel. With this commitment, you will see a significant growth in the player’s ability. Players must be willing to work with our professional trainers within a team and an individual setting. This willingness will help the player improve and realize long-term success for the player and the team. A willingness to learn, adapt and grow in multiple roles on and off the field will allow for the player to achieve their soccer potential. Players must respect the club, the coach and fellow teammates in order to succeed. Parents are an essential and important part of the success of the Predators soccer club. The parents are asked to not only ensure their sons/daughters meet the commitment, conduct and attendance standards set out above, but to also help foster a positive and supportive competitive environment. The Predator program is fortunate to have highly skilled and experienced trainers, therefore it is requested that parents refrain from sideline coaching during practices or games, but of course, the program depends upon sideline encouragement for our Predator teams. A highlight of the Predators soccer club is the active involvement, participation and camaraderie of our parents and supporters. To that end, feedback on the Predators soccer club is always welcomed through our Board or competitive committee leaders. Please arrive 20 minutes early to checkin on your first try-out. You will be given 3 sets of your number for each try-out.